Ticket prices for Virgin Galactic's suborbital SpaceShipTwo are slated to jump 25 percent in the next week or so, from $200,000 to $250,000, company officials say. The price bump comes in the wake of SpaceShipTwo's first rocket-powered test flight, a milestone the vehicle achieved Monday (April 29) in the skies above California's Mojave Air and Space Port. "In about a week’s time, we’re going to put the price up to $250,000 until the first 1,000 people have traveled, so that it matches up with inflation since we started," Virgin Galactic founder Sir Richard Branson told SPACE.com Monday. About 580 people have already put down deposits for a suborbital ride aboard SpaceShipTwo, according to Virgin Galactic's website. While these future space travelers each signed on to pay a total of $200,000, Branson said the time is right for a temporary price hike. "We felt that, for the sake of those [first]600 people who signed up…we ought to be charging inflation," Branson said. The price won't rise beyond $250,000 in the future, he added. In fact, Virgin Galactic hopes to eventually bring the price down below the original $200,000, to help make spaceflight available to more people. 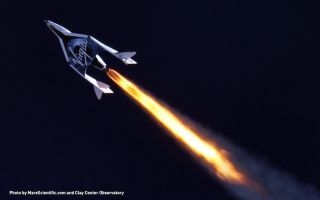 SpaceShipTwo is designed to carry six passengers to suborbital space and back. When Virgin Galactic begins commercial operations, a carrier aircraft called WhiteKnightTwo will loft SpaceShipTwo to an altitude of 50,000 feet (15,500 meters). With Monday's powered-flight test, Virgin Galactic has taken a big step toward launching its first customers to suborbital space. While company officials generally don't announce desired timelines for their various milestones, Virgin Galactic has said commercial operations could start by the end of this year or early 2014. Whenever that first official flight takes off, Branson and some of his family members intend to be on it. "Yes, we’re spitting and brushing the helmets, just making sure that they are very shiny for later this year, or very early the following year," Branson said. Leonard David, SPACE.com's Space Insider Columnist, contributed to this story.